This flag is flown to represent the current emperor, whether it appears in front of the Imperial Palace or wherever the emperor happens to be. The flag shown is for His Imperial Majesty, Emperor Hector Augustus. It is divided into two halves: the left side shows the family crest of the emperor along with the crown symbolizing his throne. 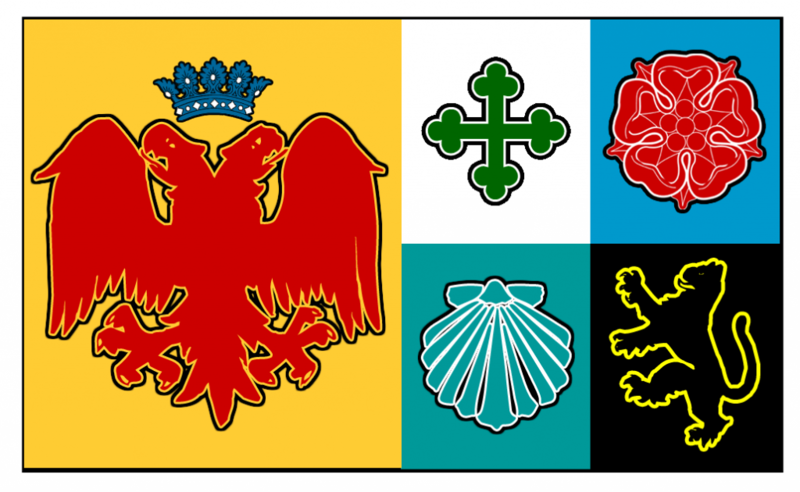 The right side is subdivided into four parts, one for each of the remaining Five Families of the Imperium. When humans came to Andromeda and began colonizing, many of the native races who lived in what would became the Imperium lost their identities as independent nations. However, although these states no longer exist, the races that lived in them maintain the symbols of their previous status. The Dahlvish flag, with its calm blue colors and the lotus flower in the center, denotes their commitment to peaceful, intellectual pursuits. 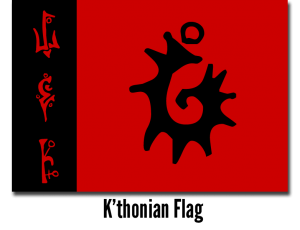 The Gordians, by contrast, are a rugged, ill-tempered race and their banner shows a twisted knot along with an intricate border. 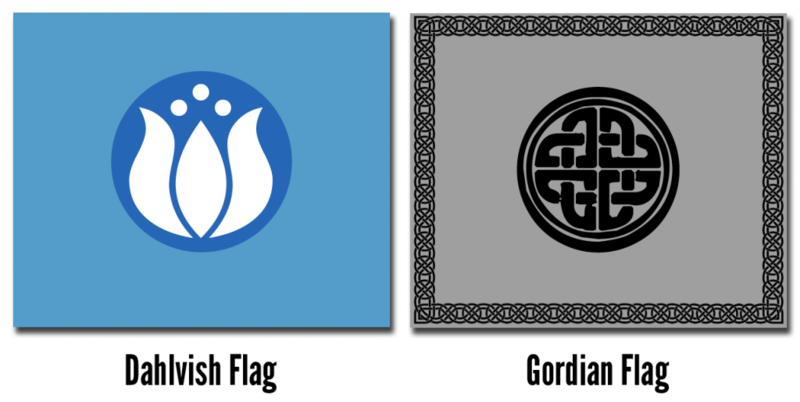 While the Dahl, who often serve as advisors to the Imperial government, can fly their flag on their home planet, the Gordians can only display their flag in secret. Other interstellar nations exist besides the Imperium and they has their own unique flags. 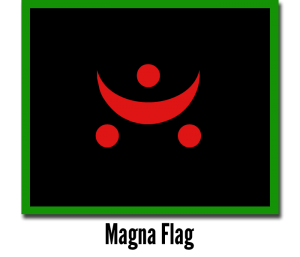 Usually considered the Imperium’s greatest enemy, the Magna Supremacy’s flag adorns many of their buildings including their embassy in Regalis. The flag consists of a red crescent in the center representing the horns of the Magna while the three circles stand for the ternary (three star) system where the Magna home world Diavol is located. The emblem floats at the center of a black field symbolizing either (it’s unclear which) the vastness of space in which the Magna claim as their own or Magna blood which has an inky appearance. Lastly, a green border surrounds the outside, matching the emerald color of Magna skin. 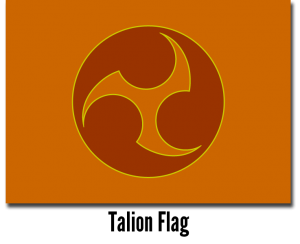 The Talion Republic, a client state of the Magna Supremacy, features orange and dark, rusty colors, as well as the triskelion (three-armed spiral) emblem in the center. Although the colors represent the tones typical of Talion scales, the meaning of the center symbol is unclear. However, some researchers believe the three arms of the triskelion are associated with the words Humility, Charity, and Bravery. Although very little is known of the K’thonian species, these raiders from the deepest parts of space often leave behind banners as well as space craft adored with the flag above. Attempts to explain the meanings behind the symbology of the banner have failed, but some of conjectured that they are lettering from an ancient and forgotten language centered somewhere out in the void. Until next time, keep having FUN WITH FLAGS! Posted in Uncategorized and tagged artwork, dragonsofandromeda, flags, worldbuilding.